My Favourite Five Disney Foods! I am often thinking about Disney treats! Homemade Mickey Pizza by yours truly! 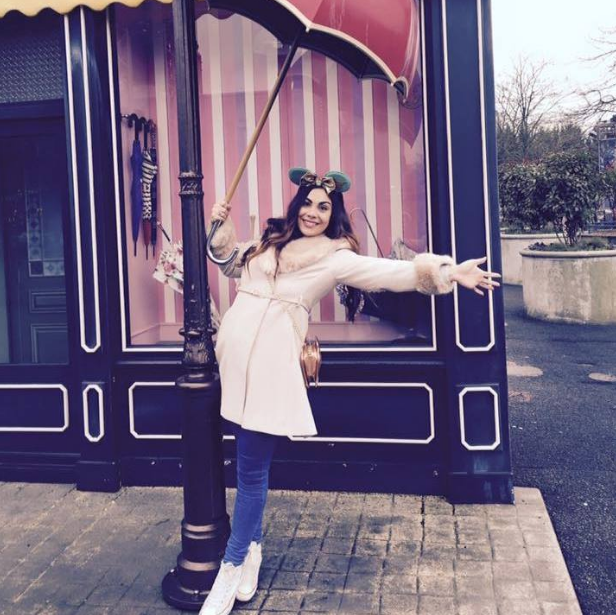 So here it is, My Top Five Favourite Disney Foods! 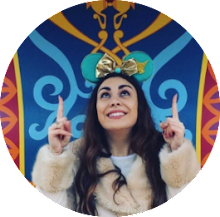 Enjoy and try not to get too hungry whilst browsing through all of the delicious Disney inspired snacks! As much as I love a Mickey Pizza, Shanghai Disneyland's Duck and Hoisin Pizza was an exception to this! In spot number five we have a Disney Parks classic; the Mickey Mouse Pizza! Pepperoni, mushroom, mozzarella - you name it, the toppings are endless! This classic Disney dish can be found in a multitude of different flavours across various dining locations in all of the Disney Resorts. However, my favourite location to eat Mickey Pizza has got to be Pizza Planet for authenticity's sake! 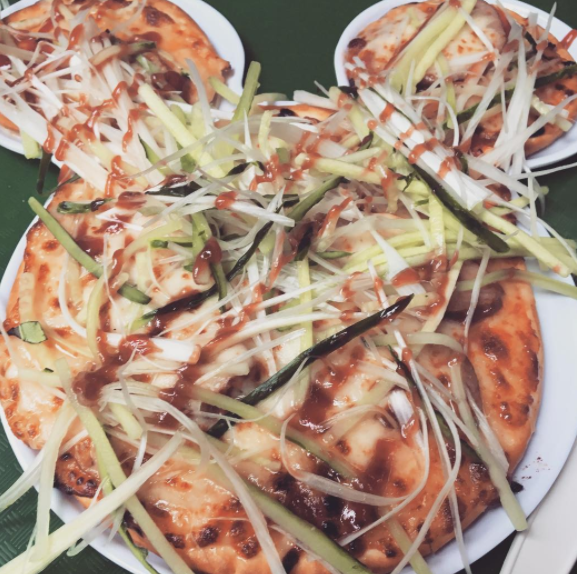 A word of caution however before you get too excited about all of the different pizza options available to you; stay well clear of Shanghai Disneyland's Duck and Hoisin flavoured Mickey Pizza. It's an Eastern take on the Italian-American favourite and sadly, the fusion is not a very successful one as I found out last year! 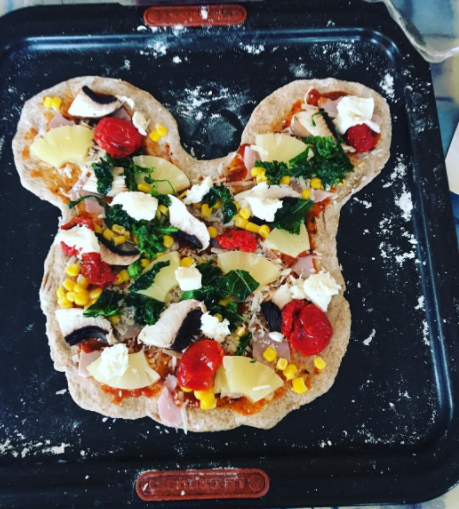 But my most favourite thing about the humble Mickey Pizza is that this is a great one for you to make at home! Simply shape your dough into that classic Mickey shape and voila! You have yourself a little piece of the Disney Parks right at home - magic! In number four, we have an all time favourite Disney food item of mine; pastries, muffins and other baked breakfast items! Again, made better for being in a Mickey shape of course! In the third spot we have quite a random food item and definitely not an especially photogenic one at that! 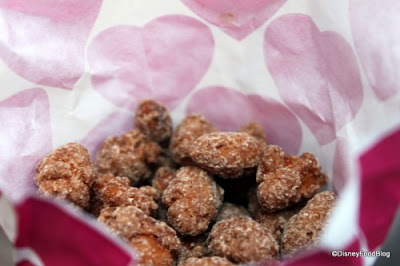 Cinnamon Glazed Almonds and Pecans from Walt Disney World's Epcot. My Dad and I discovered these little treasures during our holiday to Orlando in 2009. We were about to ride the Finding Nemo attraction in Epcot when we were suddenly stopped in our tracks by a deliciously, sumptuous scent! Adamant that we were going to discover what the smell was, we left my Mum and Sister to ride the Nemo attraction whilst we went on a little 'nutty' adventure of our own! Upon discovering the glazed nut cart, we immediately got a parcel of each and were not disappointed at all with our purchase. The smell and taste are still to this day a lovely reminder of a wonderful holiday. I would strongly recommend! It didn't take me long to sample this unique item in Shanghai! In our silver position today, we have a very modern take on a classic Disney treat... you've heard of the chocolate Mickey Ice Cream right? 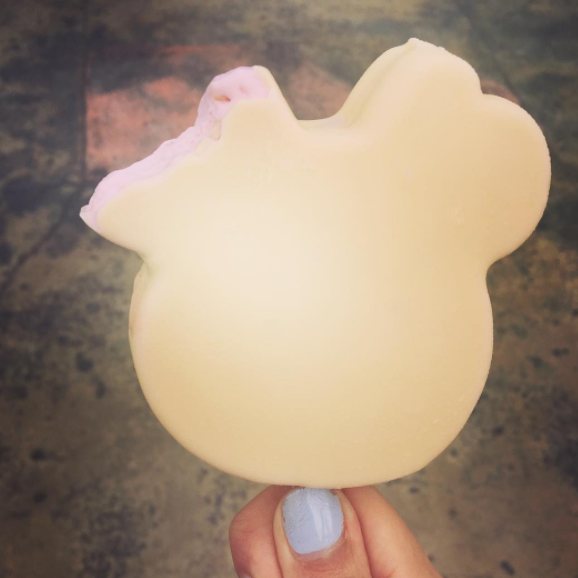 Well, behold the white chocolate and strawberry Minnie Ice Cream! 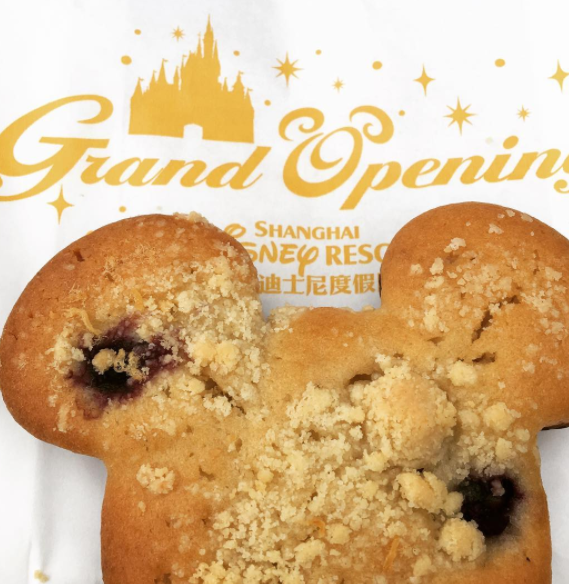 I was lucky enough to sample this treat during my trip to Shanghai Disneyland last year and it was glorious. The only negative thing about it for me is that it is not widely available in other Disney parks yet! ...hopefully I will visit again some day so that I can enjoy it once more! Of course, all Disney Ice Cream generally is great so when you're next in the parks, be sure to see what other amazing treats you can find! 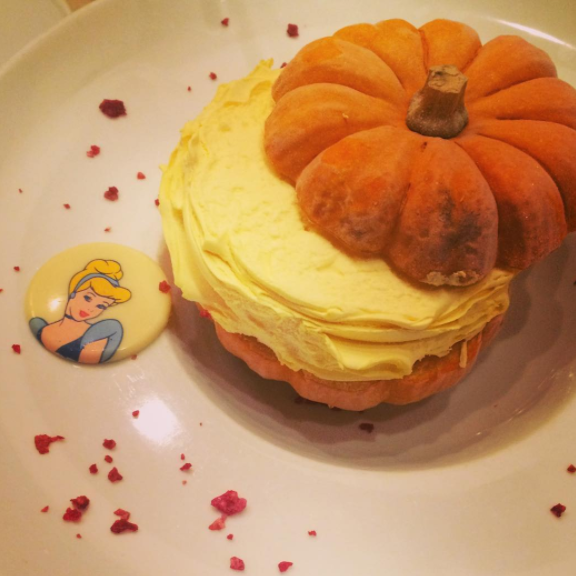 Another take on a classic Ice Cream; Cinderella's Dessert at Auberge De Cendrillon complete with vanilla ice cream, pumpkin and white chocolate! 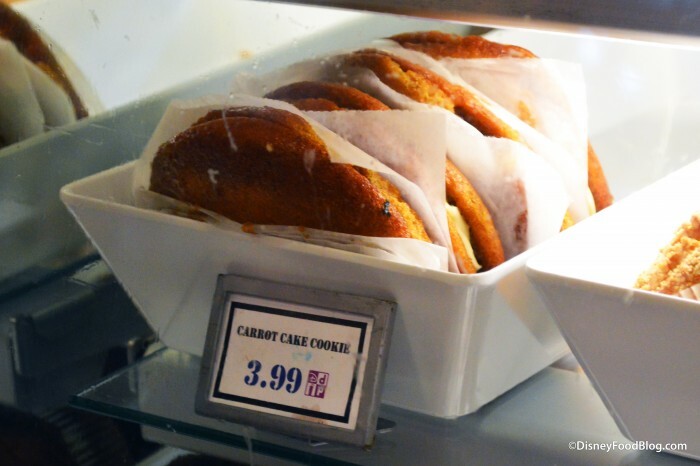 And finally, in spot number one we have my all time favourite Disney treat... the infamous Carrot Cake Cookie from The Writer's Stop in Hollywood Studios, WDW. You may already be familiar with the Carrot Cake Cookie due to it's sheer awesomeness or the fact that it won in Lou Mongello's Quest To Find The Best Snack in Walt Disney World YouTube video. Lou's video is how I discovered this wonderful treat and after hearing him rave about it, I was adamant to try it for myself during my 2012 trip to Orlando. And so I did. First of all, the Carrot Cake Cookie is HUGE. For just one serving, which only costs $3.99 (cheap enough to use as a Dining Plan snack! ), you get a huge cookie, the size of a slice of bread, which we managed to split between four of us! More than plentiful. The 'Cookie' itself is more like a huge cakey, whoopie pie - you get two of them which are sandwiched together and filled with a delicious cream cheese frosting... it's honestly so, so good! I can't express just how yummy enough! Other favourite Disney 'desset' items include pretty much all of the cupcakes available in the parks, the divine Key Lime Pie available from Adventureland in the Magic Kingdom, WDW and the Minnie Mouse Red Velvet Cake Pops available from select bakeries. 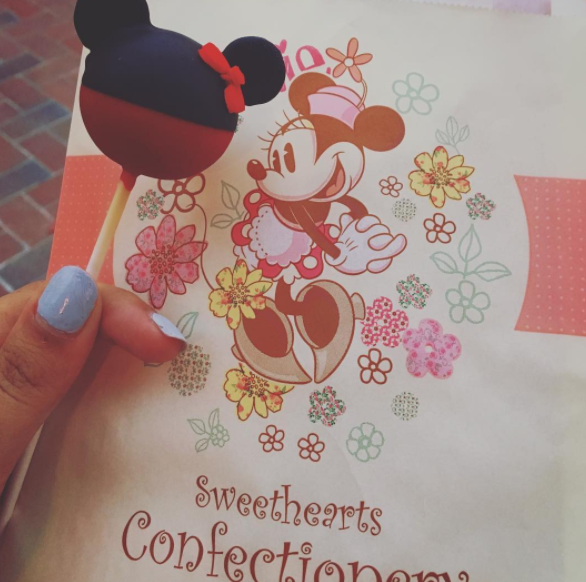 What are your favourite Disney treats? 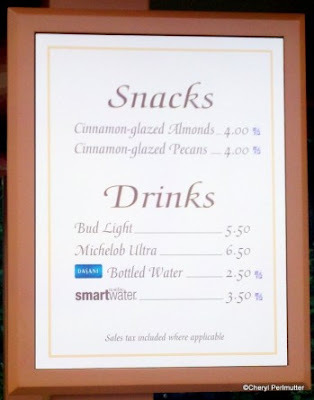 Are you surprised not to see Dole Whip or Turkey Legs featured? Perhaps it's the Main Street Popcorn that you really look forward to. 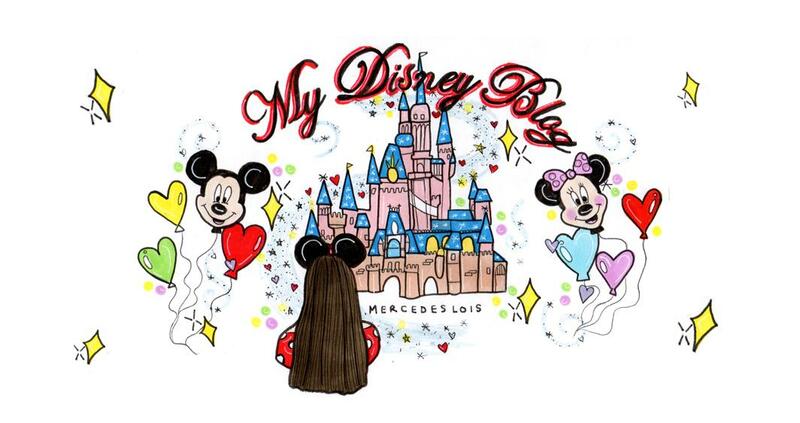 Let me know in the comments what your favourite Disney foods are... I would love to hear from you!